Logic is an ancient discipline that has undergone striking modern developments through the introduction of rigorous formal methods, stimulated largely by foundational problems in mathematics. 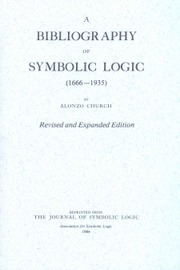 "Symbolic logic" is a term intended to encompass the entire field of logical inquiry, undertaken in this modern spirit. The Association was founded in 1936, at a time when great advances in logic were beginning to be made. Its first members were mainly mathematicians and philosophers who perceived a common ground and sought to strengthen it. Recent research in other areas such as computer science, linguistics, and cognitive science has also been inspired by logic, and the current membership and activities of the Association reflects such expanding interests. Find out more through the ASL website. 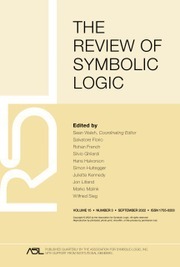 The Journal of Symbolic Logic publishes research in mathematical logic and its applications of the highest quality. Papers are expected to exhibit innovation and not merely be minor variations on established work. They should also be of interest to a broad audience. JSL has been, since its establishment in 1936, the leading journal in the world devoted to mathematical logic. Its prestige derives from its longevity and from the standard of submissions -- which, combined with the standards of reviewing, all contribute to the fact that it receives more citations than any other journal in logic. 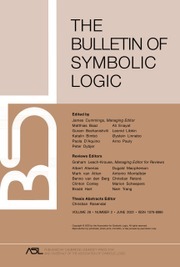 The Bulletin of Symbolic Logic was established in 1995 by the Association for Symbolic Logic to provide a journal of high standards that would be both accessible and of interest to as wide an audience as possible. It is designed to cover all areas within the purview of the ASL: mathematical logic and its applications, philosophical and non-classical logic and its applications, history and philosophy of logic, and philosophy and methodology of mathematics. The Bulletin of Symbolic Logic primarily publishes two types of papers: Articles presenting topics of broad interest in a way that is accessible to a large audience; and Communications which are announcements of important new results and ideas in any aspect of logic. The Bulletin also publishes a Reviews Section (edited by Steve Awodey) and reports of ASL meetings, Notices of interest to logicians, and the annual listing of ASL officers, Council members, committee members, and individual and institutional members of the Association. 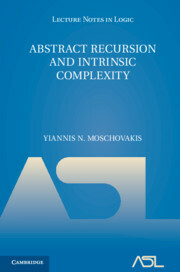 Applications of logic to the sciences, such as computer science, cognitive science, and linguistics; and logical results addressing foundational issues in the sciences. The Review welcomes submissions in all these areas. 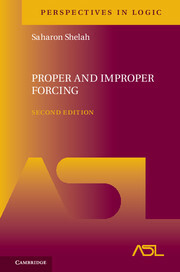 The Review began publication in June 2008. The Lecture Notes in Logic series serves researchers, teachers and students in the field of symbolic logic, broadly interpreted. The aim of the series is to bring publications to the logic community with the least possible delay and to provide rapid dissemination of the latest research. Scientific quality is the overriding criterion by which submissions are evaluated. The Perspectives in Logic series publishes substantial and high-quality books whose central theme lies in some area or aspect of logic, particularly books that present new material not available in book form. The series ranges from introductory texts suitable for beginning graduate courses to specialized monographs at the frontiers of research. Each book offers an illuminating perspective for its intended audience.